Restyling model Audi Q7 2016. The company Audi AG, recently presented a model of Audi Q7 2016 to the Court of participants International Auto Show in Detroit, is a subsidiary of the concern Volkswagen Group. Manufacturer consistently reliable and quality vehicles has become one of the leaders in the segment of luxury SUVs. Late model Q7 latest sample again won the admiration of spectators and visitors to the showroom. 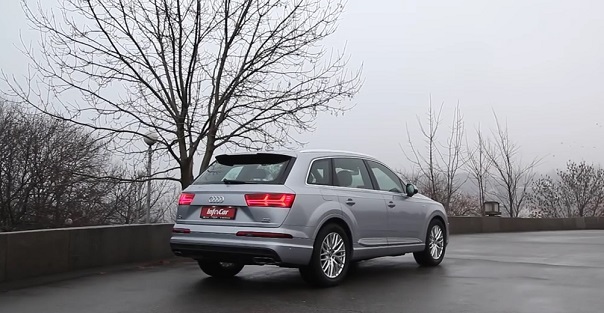 The updated model Q7 Audi version of the platform used by MLB, successfully applied in the production of four-wheel drive Lamborghini, Porsche, Bentley and Volkswagen. In the manufacture of the body involved modern composite materials and lightweight aluminum components. The revolutionary development of leading engineers of the German company has allowed to reduce the weight represented by SUV at 330 kg. Due to the reduced weight the car is accelerated from a place much faster and has a higher speed performance on the road and contributes to significant savings in fuel consumption. Changed design of the front grille and bumper, began to look much more attractive than the new optical devices using LEDs in red. The rear lights are rectangular rather elegant look with a new, chiseled design of the car body. The nose of the car looks narrower than the models of the past, and the length of Q7 Audi in 2016 a little less. Capacity spacious interior Q7 did not hurt — it is capable of accommodating seven people, accommodates three rows of seats, two of which are formed and, if necessary, cleaned the floor. More sports became Interior — have been excluded from it inappropriate jewelry and now he seems to be Spartan, but functionally did not deteriorated. New computer 12,3 «TFT-screen rises from the depths of the dashboard using only light pressure sensor on the control panel. For the most discerning customer can order embedded in the back of the first row of seats two 10.1 «tablets. High-quality screen, memory for 32 Gb — Audi will do everything for the convenience of the passengers in the back seat, and the organization of their leisure time in a long journey. In addition, all passengers of the new Audi flagship is an option WiFi, as well as on the connection information and entertainment complex MMI. • The three-liter V6 TFSI engine capacity of 333 liters. a. with a torque of 439 N / m and speed up to 100 km / h in 6.1 seconds. The planned measure efficiency of movement in combined cycle driving consumption of 7.84 liters of fuel per 100 kilometers. • The two-liter gasoline engine TFSIs four working cylinders. Develops capacity 252 liters. from. and 368 newtons / meter of torque. • Diesel TDI engine capacity to three liters. Of torque 599 N / m and has a capacity of 272 liters. from. • equipped with a turbocharged V6 engine that can accelerate the crossover curb weight of about two tons, to 100 km / h in 6.3 seconds. The planned measure efficiency of movement in combined cycle driving is — 5.72 liters of fuel per 100 kilometers. • Also presented TDI volume of two liters, which develops torque 498 N / m, a capacity of 218 liters. from. The new Q7 mechanical force from the engine is transmitted through the eight-speed Tiptronic four-wheel drive system, Audi Quattro all-wheel drive car. Prepared for mass production next year, and the modern model of Audi Q7 hybrid in 2016 with the installation of e-Quattro, diesel TDIs combines an electric motor with an integrated eight-automatic Tiptronic. Fantastic fuel consumption in the combined cycle ride — up to 1.7 liters per 100 kilometers, allow this car to prophesy a great demand and a cloudless future. Furthermore, interesting combination in a hybrid installation diesel engine with an electric motor. This allows the car to build 699 N / m torque capacity of 373 liters. from. Also, do not forget about the latest lithium-ion batteries — they are able to provide 54 kilometers by car motors, without the help of the main motor. While there is no precise information about the price of Audi Q7, but it is expected that they will start from 3.5-4 million rubles, which is only slightly less than the cost of budget apartments in Moscow, so this car — an expensive pleasure. But instead the company Audi has promised to provide good discounts on loans for the purchase of their cars.